Polarization of the neuron’s membrane: Sodium is on the outside, and potassium is on the inside. You’re probably wondering: How can the charge inside the cell be negative if the cell contains positive ions? Good question. The answer is that in addition to the K+, negatively charged protein and nucleic acid molecules also inhabit the cell; therefore, the inside is negative as compared to the outside. Then, if cell membranes allow ions to cross, how does the Na+ stay outside and the K+ stay inside? If this thought crossed your mind, you deserve a huge gold star! The answer is that the Na+ and K+ do, in fact, move back and forth across the membrane. However, Mother Nature thought of everything. There are Na+/K+ pumps on the membrane that pump the Na+ back outside and the K+ back inside. The charge of an ion inhibits membrane permeability (that is, makes it difficult for other things to cross the membrane). When the neuron is inactive and polarized, it’s said to be at its resting potential. It remains this way until a stimulus comes along. Action potential: Sodium ions move inside the membrane. When a stimulus reaches a resting neuron, the gated ion channels on the resting neuron’s membrane open suddenly and allow the Na+ that was on the outside of the membrane to go rushing into the cell. As this happens, the neuron goes from being polarized to being depolarized. Remember that when the neuron was polarized, the outside of the membrane was positive, and the inside of the membrane was negative. Well, after more positive ions go charging inside the membrane, the inside becomes positive, as well; polarization is removed and the threshold is reached. Each neuron has a threshold level — the point at which there’s no holding back. After the stimulus goes above the threshold level, more gated ion channels open and allow more Na+ inside the cell. This causes complete depolarization of the neuron and an action potential is created. In this state, the neuron continues to open Na+ channels all along the membrane. When this occurs, it’s an all-or-none phenomenon. “All-or-none” means that if a stimulus doesn’t exceed the threshold level and cause all the gates to open, no action potential results; however, after the threshold is crossed, there’s no turning back: Complete depolarization occurs and the stimulus will be transmitted. When an impulse travels down an axon covered by a myelin sheath, the impulse must move between the uninsulated gaps called nodes of Ranvier that exist between each Schwann cell. After the inside of the cell becomes flooded with Na+, the gated ion channels on the inside of the membrane open to allow the K+ to move to the outside of the membrane. With K+ moving to the outside, the membrane’s repolarization restores electrical balance, although it’s opposite of the initial polarized membrane that had Na+ on the outside and K+ on the inside. Just after the K+ gates open, the Na+ gates close; otherwise, the membrane couldn’t repolarize. When the K+ gates finally close, the neuron has slightly more K+ on the outside than it has Na+ on the inside. This causes the membrane potential to drop slightly lower than the resting potential, and the membrane is said to be hyperpolarized because it has a greater potential. (Because the membrane’s potential is lower, it has more room to “grow.”). This period doesn’t last long, though (well, none of these steps take long!). 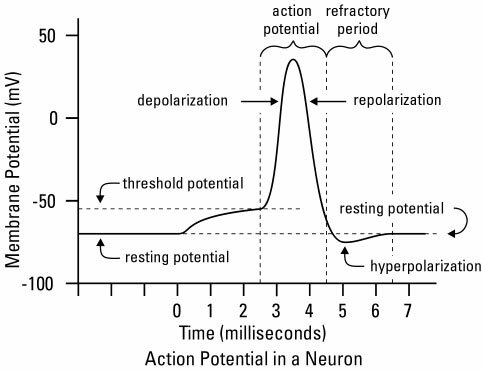 After the impulse has traveled through the neuron, the action potential is over, and the cell membrane returns to normal (that is, the resting potential). The refractory period is when the Na+ and K+ are returned to their original sides: Na+ on the outside and K+ on the inside. While the neuron is busy returning everything to normal, it doesn’t respond to any incoming stimuli. It’s kind of like letting your answering machine pick up the phone call that makes your phone ring just as you walk in the door with your hands full. After the Na+/K+ pumps return the ions to their rightful side of the neuron’s cell membrane, the neuron is back to its normal polarized state and stays in the resting potential until another impulse comes along. The following figure shows transmission of an impulse. Transmission of a nerve impulse: Resting potential and action potential. At the end of the axon from which the impulse is coming, the membrane depolarizes, gated ion channels open, and calcium ions (Ca2+) are allowed to enter the cell. When the calcium ions rush in, a chemical called a neurotransmitter is released into the synapse. The neurotransmitter binds with receptors on the neuron. The chemical that serves as the neurotransmitter moves across the synapse and binds to proteins on the neuron membrane that’s about to receive the impulse. The proteins serve as the receptors, and different proteins serve as receptors for different neurotransmitters — that is, neurotransmitters have specific receptors. Excitation or inhibition of the membrane occurs. Whether excitation or inhibition occurs depends on what chemical served as the neurotransmitter and the result that it had. For example, if the neurotransmitter causes the Na+ channels to open, the neuron membrane becomes depolarized, and the impulse is carried through that neuron. If the K+ channels open, the neuron membrane becomes hyperpolarized, and inhibition occurs. The impulse is stopped dead if an action potential cannot be generated. If you’re wondering what happens to the neurotransmitter after it binds to the receptor, you’re really getting good at this anatomy and physiology stuff. Here’s the story: After the neurotransmitter produces its effect, whether it’s excitation or inhibition, the receptor releases it and the neurotransmitter goes back into the synapse. In the synapse, the cell “recycles” the degraded neurotransmitter. The chemicals go back into the membrane so that during the next impulse, when the synaptic vesicles bind to the membrane, the complete neurotransmitter can again be released.